If you’re looking for a quick, easy and ridiculously inexpensive gift idea for your friends or family, these DIY candy button dot earrings are just the thing for you! When I say that they’re inexpensive, I mean that each pair of these costs only FIFTEEN CENTS to make! You can gift an entire strip of these fun candy button earrings for under $1.00! See what I mean – ridiculously inexpensive! Start by preheating your oven – 350 degrees for perler beads (shown above on the left) or 400 degrees for pony beads (on the right) and lining a baking sheet with parchment paper. (Note: although I am showing them together in the photo above, they need to be melted separately due to the different temperatures.) DO NOT use the convection setting if your oven has one! 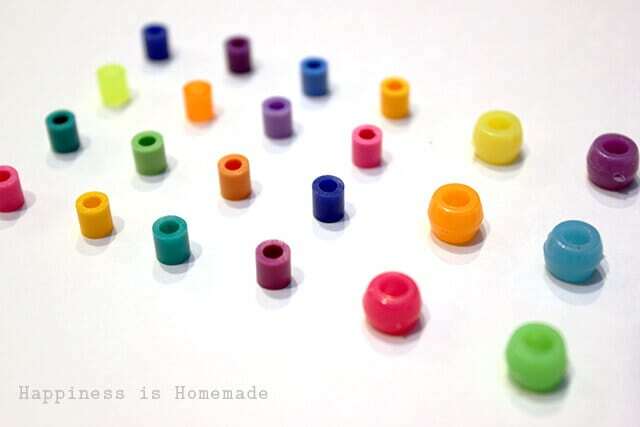 Perler beads are designed to be melted, so they will not cause any odors or fumes; however, the larger plastic pony beads will release a strong melting plastic smell. I highly advise melting pony beads in a well ventilated area only! Keep a close eye on your beads as they are melting! Perler beads take about 30 minutes at 350 degrees to form the candy dot shape (first melting into flat rings and then into a dot after awhile). Pony beads melt much more quickly, and they will continue to spread and get flatter and wider the longer they are left in the oven. I generally remove mine after 8-10 minutes at 400 degrees. Allow to cool before removing from the parchment paper. Use a small dab of E600 glue to attach the earring posts to the back of the dots. I like to pour a small amount of glue into a container and then use a toothpick to apply it to the small surfaces. Allow to dry and cure for 24 hours. 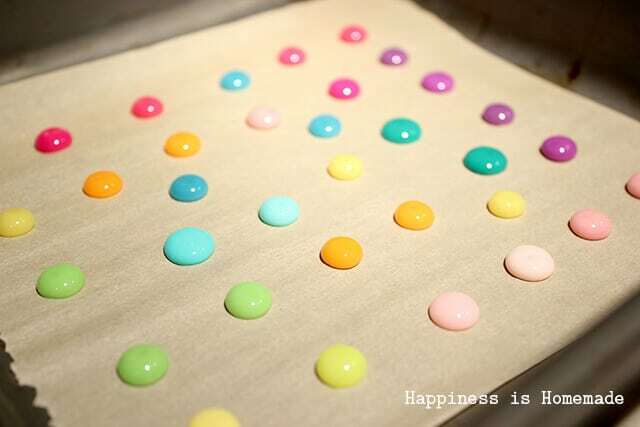 Cut a strip of white cardstock approximately 2″x6″ and poke the earrings through to look like candy buttons. Secure the earring backs on the reverse side of the cardstock to keep the earrings in place. You can see the size difference between the pony beads (left) and the perler beads (right). The pony bead earrings are more appropriately sized for older children and adults while the smaller sized perler beads will work for all ages. I just can’t get over how cute and fun these are (and ridiculously inexpensive, of course!)! These DIY candy button earrings are sure to be a huge hit with both children and adults alike! Now you can knock off everyone on your Christmas list for just a few dollars! My son has a ton of perler beads he doesn’t use, so I can’t wait to try this! Thank you! This was great. Thanks. I tried it with pony beads, but they melted into random blobs. Actually, HALF-melted blobs. I assume that’s because I got metallic ones. The perler beads turned out well, but they are super tiny. I also got rondelle beads and those turned out beautifully. Office gift exchange, here I come! oh my goodness I adore these!! I have to make some for my daughter now! thanks for sharing! I used neon perler beads and just made rondelles out of them. They turned out beautiful. Thank you for sharing. Will a monogram stick to it? the pastel color beads….which brand are those? Did you use biggie beads or small ones? I just love those colors. Hi, this is my first time trying this project. I purchased the 4+ Biggie Beads from Michael’s. But i’m not sure if they will be to big for a 4& 6 year old when they melt. is there a specific size i should look for, for children ? how long did you bake the biggie beads? I’ve tried several times to do the pony beads and they never melt evenly. Some work and most bubble and blob out. What could I be doing wrong?